My pepper shrimp recipe is rated H for Hot. 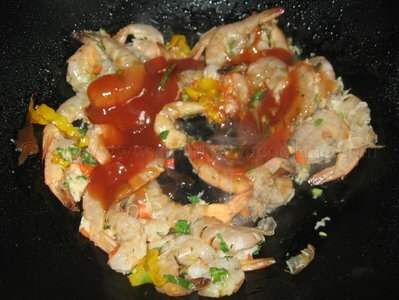 Any hotter than this, and this pepper shrimp recipe would be banned for inducing spontaneous combustion LOL!! hahaha. 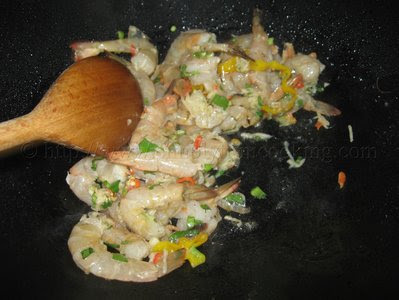 Pepper shrimp is a recipe that has been influenced by our Chinese heritage on the island, but like all other trini recipes, this one has evolved to a more trini style Chinese recipe in our main stream trini cooking. First of all, the method is a little different (at least how we do it is!) 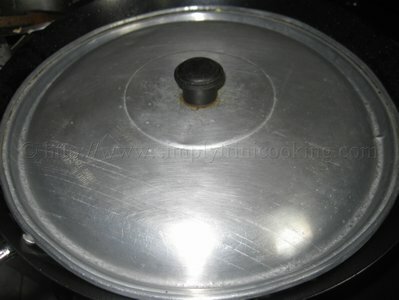 to traditional Chinese cooking. 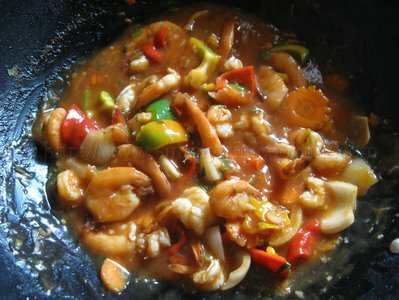 How I like to put it, is that it starts of Chinese but by the end of its cooking the pepper shrimp becomes Trini. 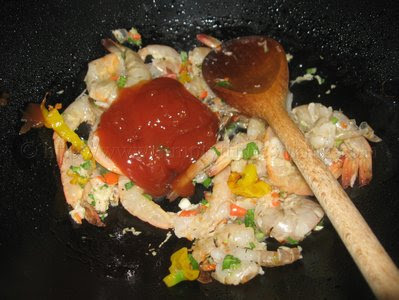 What I would like to think makes Pepper Shrimp very Trini is the amount of ketchup that is used. 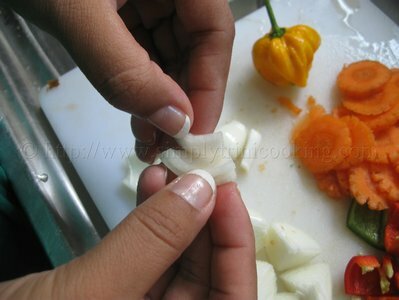 If you know anything about the trini palate, you’ll know that we love ketchup. 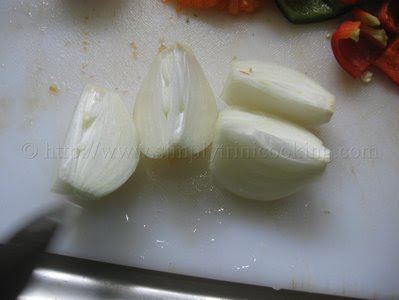 Added to that, there is also the, distinctly trini, seasonings that we use: there’s lots of chadon beni, chive and garlic. 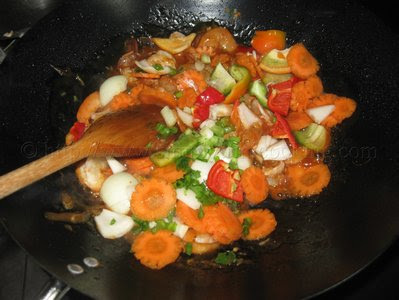 This trini style pepper shrimp is a sure winner in our kitchen and once you master it, it will be in yours too. 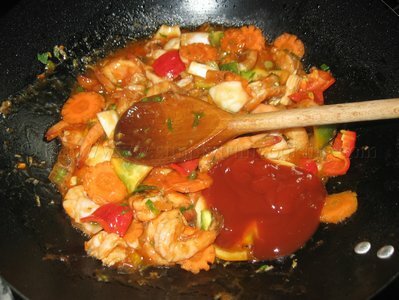 It goes great as a side with fried rice and perhaps anything you could think of: probably with Hops bread too who knows! One thing for sure is that it would surely add some spice to your life! 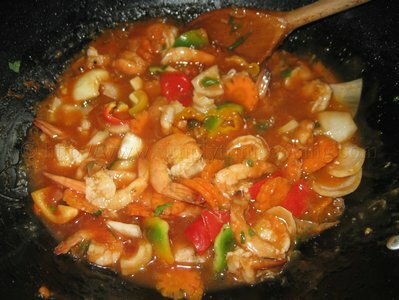 Here’s pepper shrimp trinistyle. Enjoy! 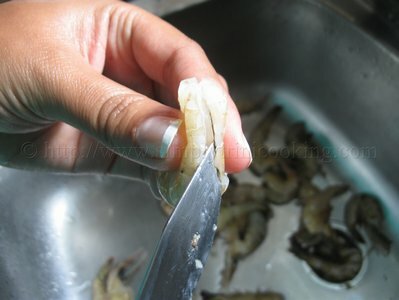 Devein the shrimp leaving the shell on. 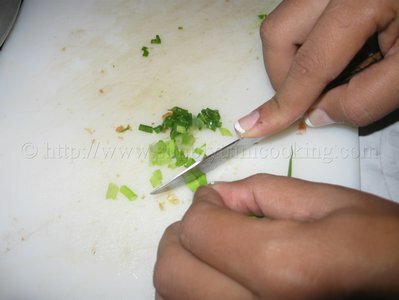 Season with ginger, pimento pepper, garlic, black pepper, chadon beni, lime juice, 1 chive and salt. 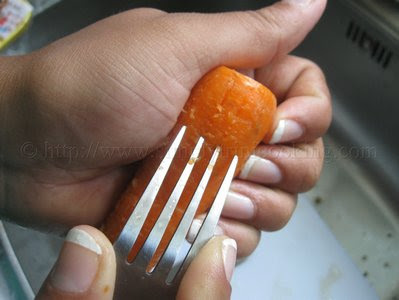 Take a fork and scour the sides of the carrot. Note: We are doing this to make a pattern. 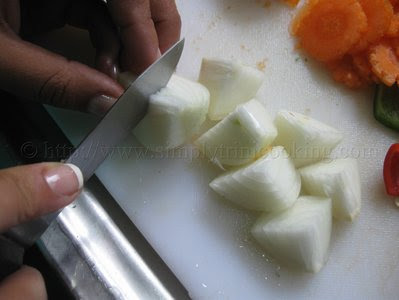 Cut the onion in four. 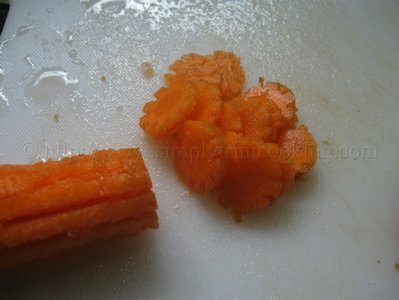 Then cut each piece in half. 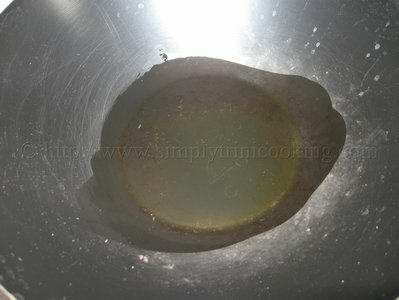 Heat the oil in the wok over a medium flame. 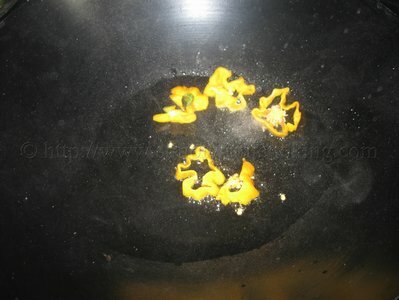 Add the hot pepper and fry for 1 minute. 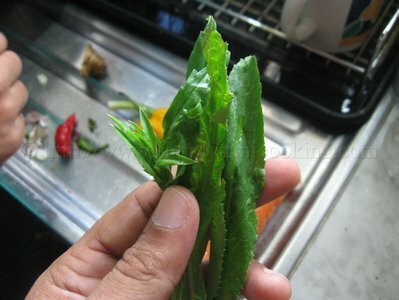 Note: Frying hot pepper releases noxious fumes which can burn your eyes and make you cough and sneeze so be careful. I actually had to take the photograph quickly and run out of the kitchen but I still ended up with watery eyes and had an uncontrollable sneeze! (*sniff, sniff, Achoo! *) lol! 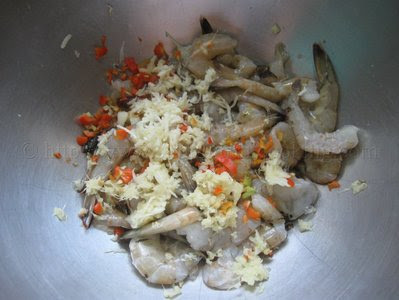 Add the shrimp and stir fry for 1 minute. The pepper shrimp looks good now. The water has reduced to the right consistency. 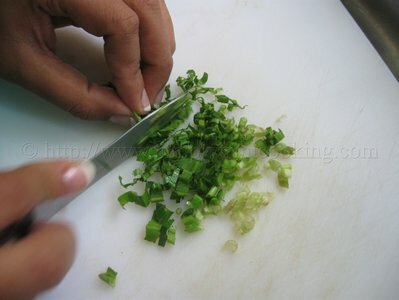 Garnish with a sprig of chive. 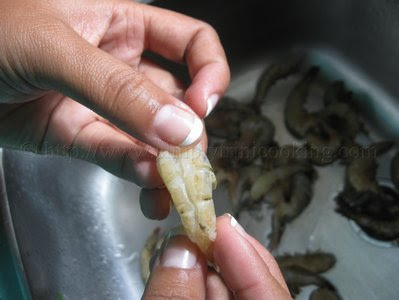 Now you know how to make trinistyle pepper shrimp. I hope it was a wonderful experience for you. 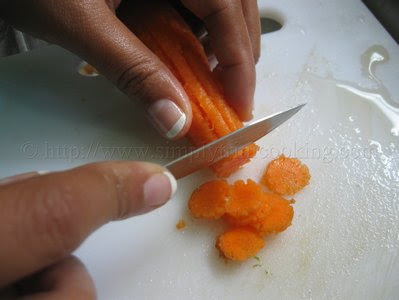 See you next week with more trini recipes. P.S. 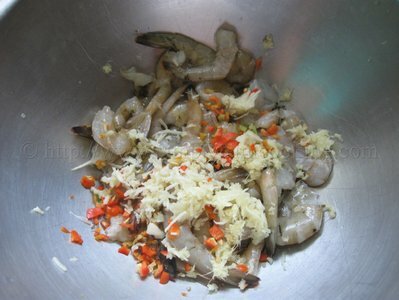 If you liked my pepper shrimp recipe why not leave a comment below. 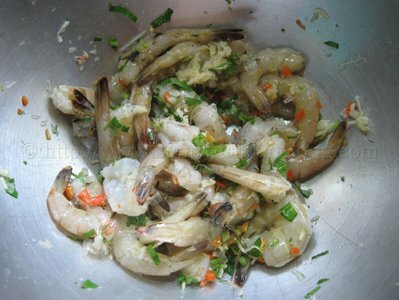 I tried other pepper shrimp recipes but they were never this simple or tasty. looks sooo yummy can’t wait to try this ….thanks 4 sharing !!!! I made this many times and it’s always delightful and mouth watering! Thank you for the many delicious recipes Felix! 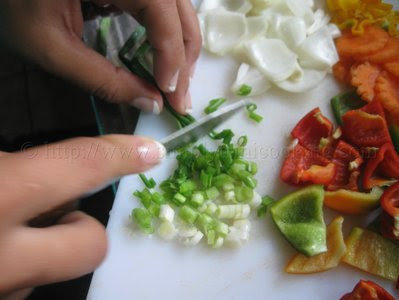 Hey man tried this recipe with the vegetable chow mein….fantastic…this blog is awesome. This is sooo delish I made it today….can’t wait to the hubby get home. I made pepper shrimp with the vegetable chow mein for my co-workers and we had it for lunch today. They loved it !!!! Im so glad I found this recipe.simple and great. Great recipe. My family loves it. Thanks for sharing. I love your recipes… Thanks for sharing…. Just made this for my Trini wife living in Scotland. She is in heaven, the real deal taste of Trinidad. Thanks. 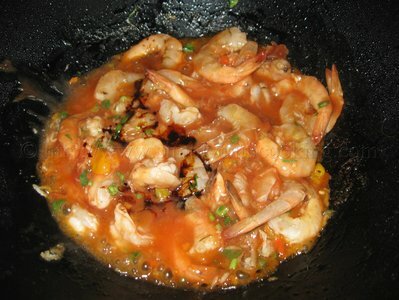 Hi, This recipe sounds great but I am looking for the recipe for the shrimp cocktail made with a pink sauce. I have been to Trinidad twice first in 1977. I went to a restaurant there and I can’t remember the name for anything. They served it there. The best dish I have ever eaten and I have been looking for this recipe since I left. Any possible way you may know what I am talking about? Or anyone who reads this. Desperate in Texas. 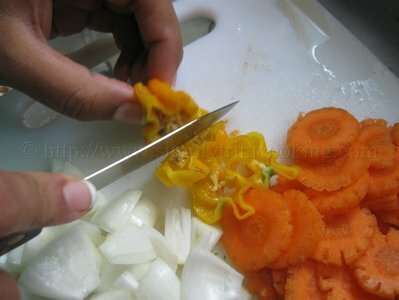 Thanks and I love Trini cooking. As a trini living in Canada. 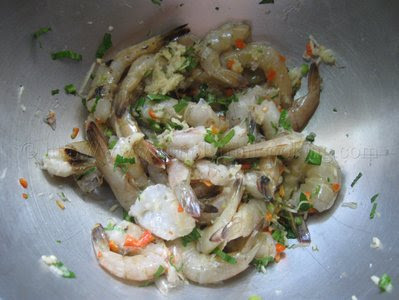 I LOVE your recipes and keep coming back to your site especially for the pepper shrimp recipe! Excellence in cooking! Keep it up! I tried this recipe and it was delicious. Thank you so much for this wonderful recipe. Fantastic! Love the pictures and steps as well! 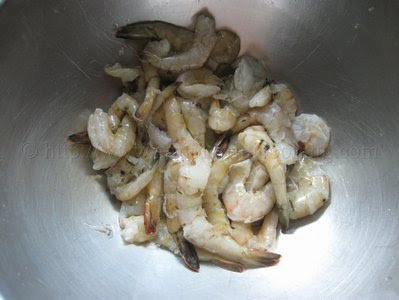 Love your recipe…been making this for years (very similar to your recipe)..I usually like to quick fry the shrimp in the shell..gives it a nice crunch….?? Thaaaank You!!! wanted to learn to make this for a very long time….kudos! Used your recipe, it was hands down the best pepper shrimp I have ever had anywhere, even better than restaurant quality. 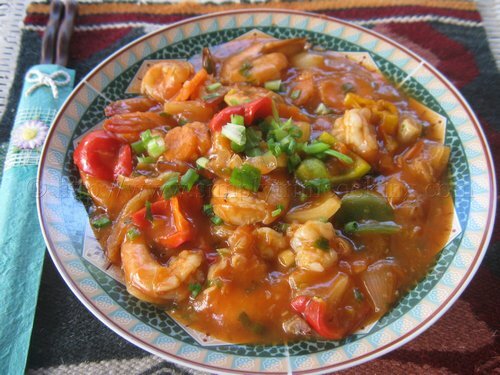 I tried this pepper shrimp today and it was the best!!! Thank you! 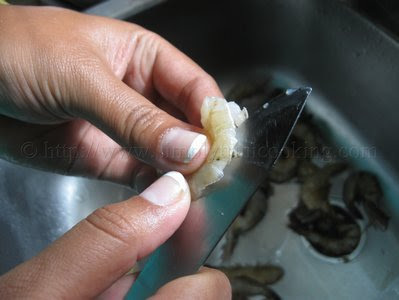 I’ve tried most of your recipes so far including this one and everything is so simple and tasty. Love it!